Today for Football Friday I am sharing a tailgating/holiday recipe. I have a serious weakness for anything with Butterfingers and peanut butter. Needless to say, I have zero self-control around these yummy Chocolate Butterfinger Balls!! Peanut butter, powdered sugar and crushed Butterfingers dipped in chocolate. OMG! YASSSS!!! 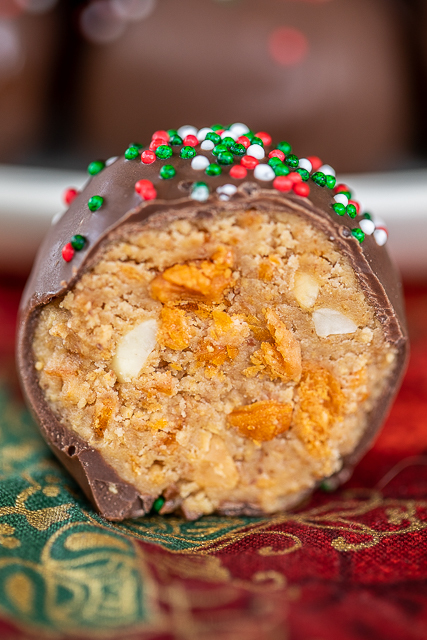 Look at the inside of these Butterfinger Balls! Look at all those Butterfinger bits. 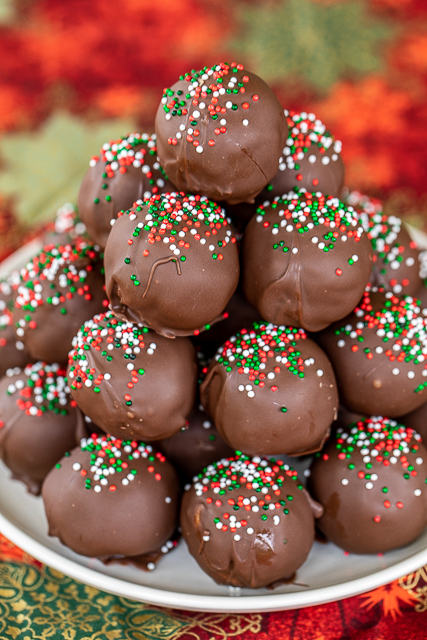 I used crunchy peanut butter in these balls. Feel free to use creamy if you don't like chunks of peanuts. These are great for all your upcoming holiday parties! 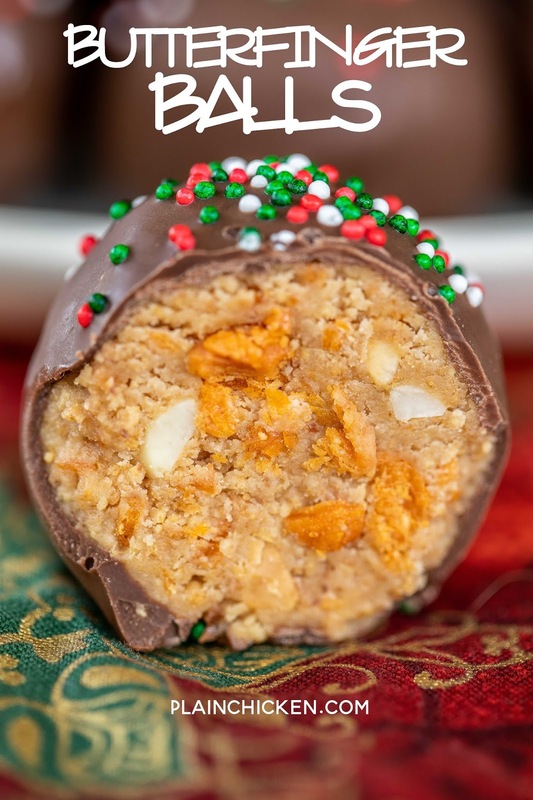 You can make these Butterfinger Balls several days in advance and store them in an air-tight container until you are ready to serve them. 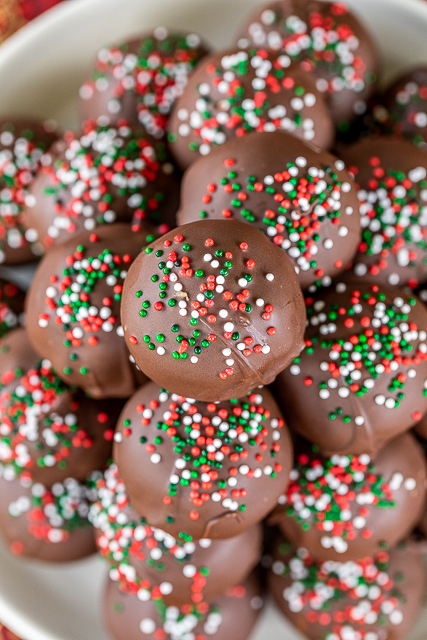 Decorate the balls with any color sprinkles - Christmas, valentines, birthday sprinkles or your favorite team colors. This recipe makes about 3 or 4 dozen, depending on how big you make the balls. I like to give these Butterfinger Balls as gifts. Package them up in a little cellophane bags with a cute ribbon. Perfect party favor or homemade gift for neighbors, co-workers and teachers. In a large bowl, combine powdered sugar, graham cracker crumbs, Butterfinger bits, melted butter and peanut butter. Shape into 1-inch balls and refrigerate for 30 minutes. Melt chocolate almond bark according to package directions. 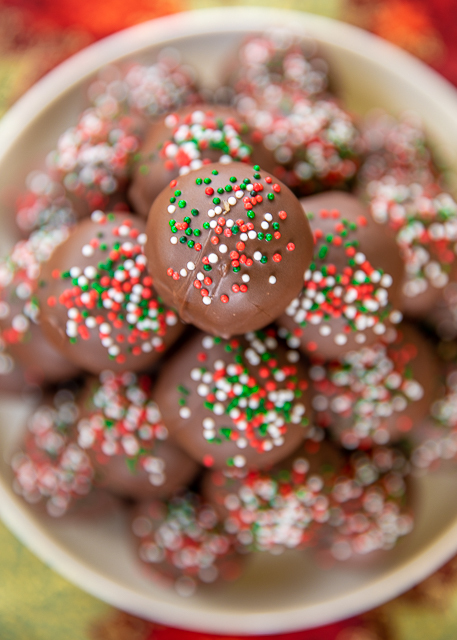 Remove balls from refrigerator and dip into chocolate almond bark. 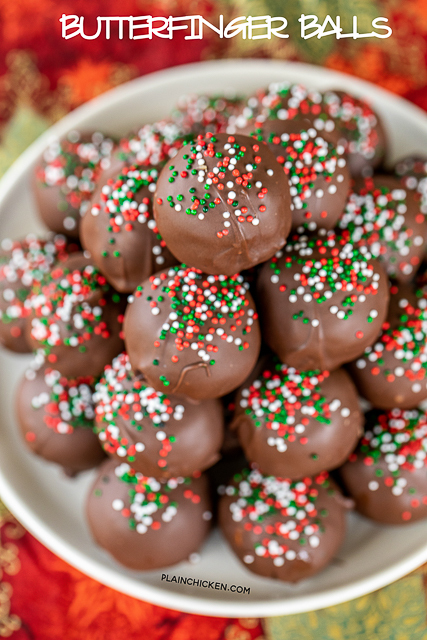 Place dipped balls on parchment or wax paper and let sit until set. Hi, I've searched for the Butterfinger bits. No longer available at Target, Walmart or Amazon. Where can you purchase them? Thanks! If you can't find them, you can crush up 5 regular sized Butterfinger candy bars. Looking forward to trying these! Do you recommend salted or unsalted butter?